Wellness is a process that has many steps to it. The true path to achieve wellness is to soak it in slowly and in a systematic way. Spas have always served the idea for the perfect getaway to achieve peace and satisfaction of the soul but it is of no use if the services cannot provide any inner advantage to the body. In a conversation with R The Spa at Radisson Blu Plaza, Delhi, for our Indian Salon and Wellness Yearbook 2017, the brand tells us what all they offer so that their customers can attain relaxation not just physically but also mentally and spiritually and a lot more. Through extensive research in ancient beauty philosophy and body therapy, the spa has in its menu an admirable array of treatments which pamper you from head to toe. These therapies, combined with the finest botanical products like Pevonia and Spa Factory Bali ensure that your journey of the senses is truly blissful. The spa is undoubtedly the largest in town, spreading over 20,000 sq. ft. of three level spaces, providing a unique complete experience for the guests. Each level of the spa focuses on one important aspect of well-being. The first level is about rejuvenation with a focus on fitness through workout and Yoga, thus rejuvenating your enthusiasm and zest for life. The state-of-the-art fitness studio equipped with techno gym equipment makes the experience truly rejuvenating. A swim in the specially designed beautiful pool and its surroundings add to the experience. 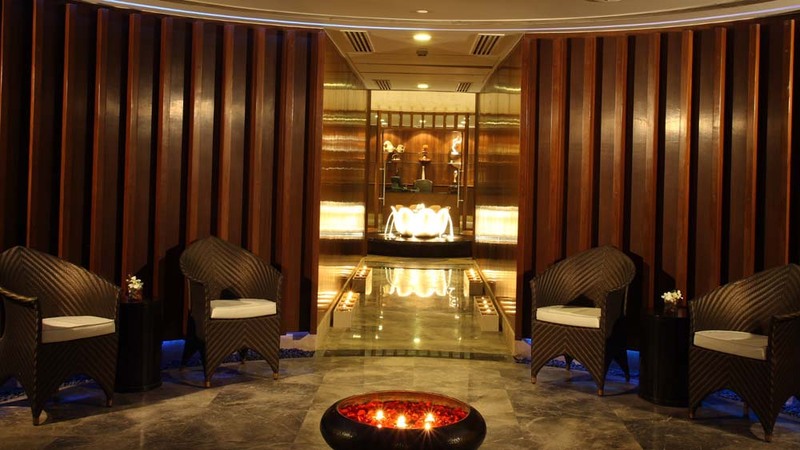 The Spa Bar, featuring a healthy and nutritious cuisine, compliments the rejuvenation regime. The second level is about relaxation where each guest goes through a heavenly experience with one of the many massage options in special couple suites or rooms to choose from. Aesthetically designed and carefully equipped, each couple treatment suite and room relaxes you the moment you step in. The third level is about replenishment, offered by the stunning beauty, grooming and styling studio. The exclusive salon, independent one for men and women are specially designed for complete comfort. Both have modern equipment for foot reflexology, pedicure and manicure, face therapies like the caviar and pearl age defying mask, Luminiere face therapy and oxygenating sea mask that carefully replenish your skin, giving you an admirable glow. Extended spa treatments are provided in self contained, elaborate luxurious thematic spa suites featuring carefully designed therapies and one of its kind of equipments like aqua bed with a floating experience, vichy shower, hamam table and experience shower, spa bar, which features a healthy and nutritious cuisine which complements the rejuvenation regime at fitness studio . High fibre low calorie snacks, energy drinks, fresh juices, mocktails, herbal teas and salads go very well with its offering of rejuvenation through fitness, state-of the art equipment, product line, aesthetics, landscaped spa exterior.